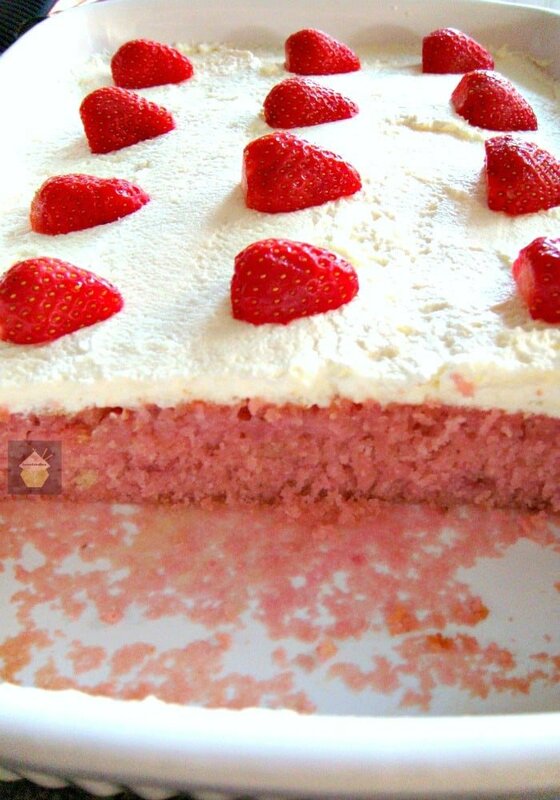 Strawberry and Coconut Cake (Poke Cake) with Fresh Whipped Cream. Easy made from scratch recipe. Yummy! Well….. What can I say? 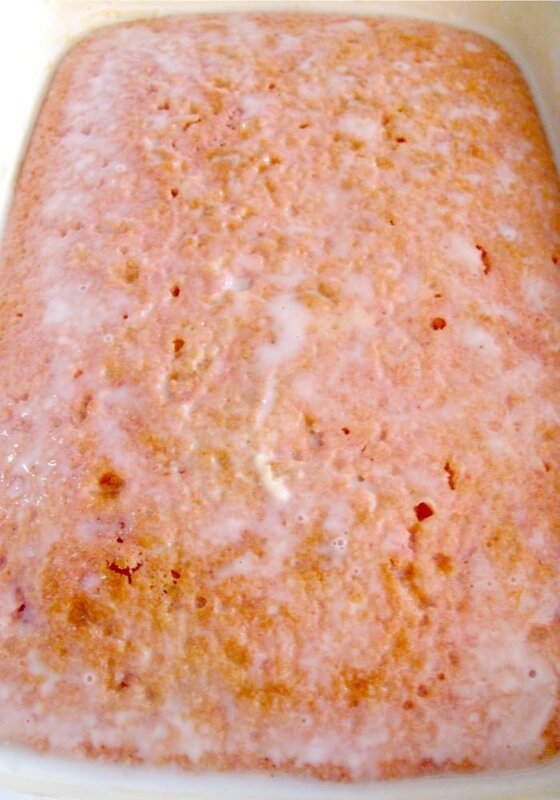 Moist Strawberry and Coconut Cake just scream deliciousness! The fresh sweet strawberries combined with the creamy tropical flavour only coconut can give makes for an extremely wonderful cake, full of delight! This strawberry and coconut poke cake is topped with some whipped cream and fresh strawberries. It’s a very simple and easy recipe to make cake from scratch and it’s a definite winner and one which will be made time and time again. 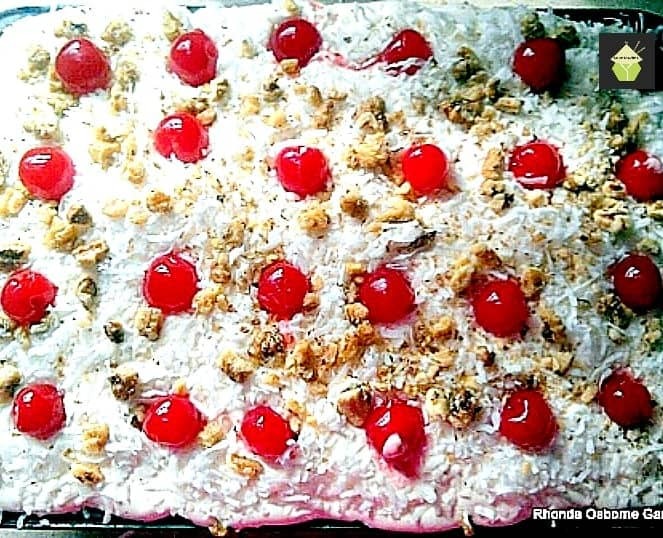 Its incredible moistness is down to the coconut working its magic in the cake, and with every bite, you can be guaranteed a hit of strawberries and coconut. What a pleasing cake this is to make and eat! 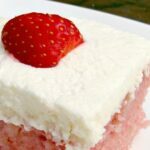 Our Strawberry and coconut poke cake is a great cake to take along to a potluck, party, BBQ, or church event if you attend those. You can make it in a sheet pan style, cut in to as many portions as you wish and transport it in the pan so there’s no mess! 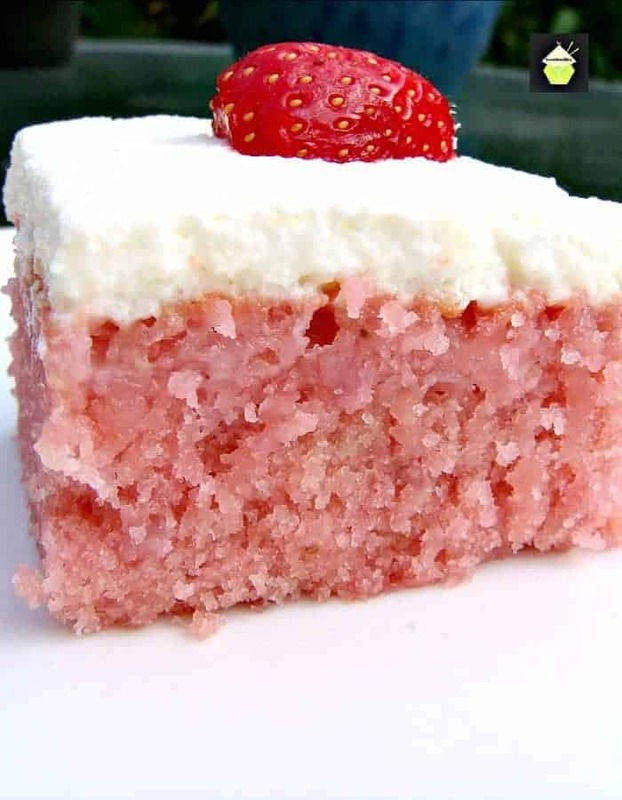 So let’s get straight to the recipe and see how we make our strawberry and coconut poke cake. Please enjoy! Yield: it makes a large cake, using a 9 x 13 pan. Grease and flour 9 x 13 pan. 2. In a large bowl, cream together the butter, sugar and powdered strawberry jelly until light and fluffy. Beat in eggs one at a time, mixing well after each. Combine the flour and baking powder; stir into the batter alternately with the coconut milk. 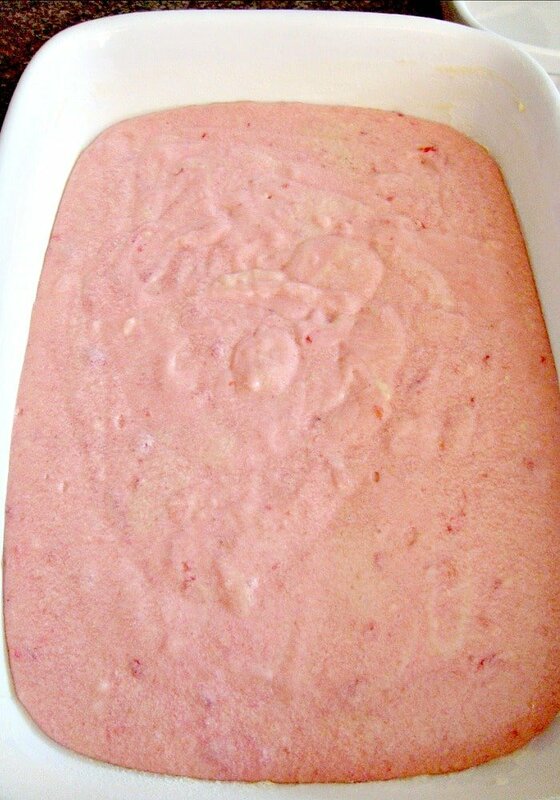 Fold in vanilla and strawberry puree. Pour evenly into baking pan. 3. Bake for 25 to 30 minutes in the preheated oven, or until a small knife inserted into the centre of the cake comes out clean. 4. Whilst the cake is still hot, poke holes all over the cake with a skewer or fork then slowly pour the coconut milk all over the cake. Leave to cool. ****Be sure to pour evenly so the liquid soaks in even at the sides. 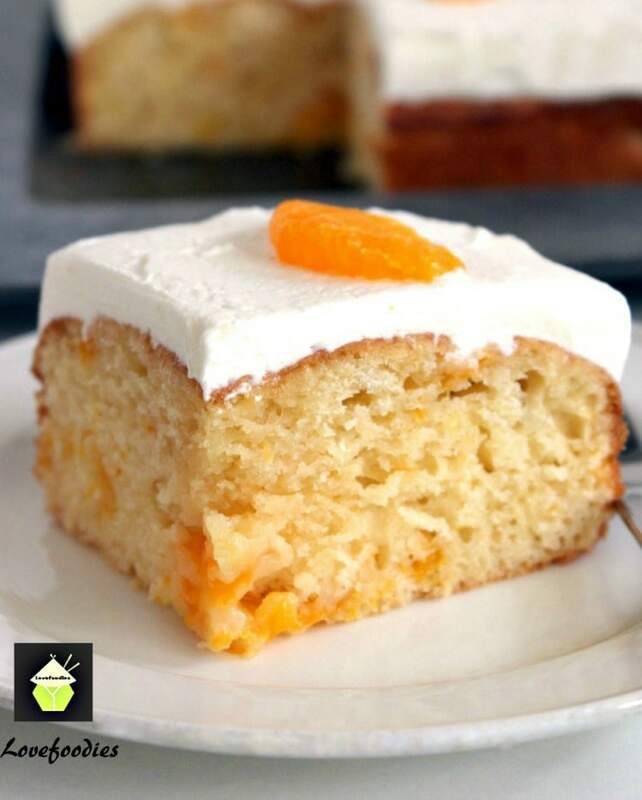 The frosting – do this once the cake has COMPLETELY COOLED! Add 1 teaspoon of vanilla extract (optional) to the cool whip and then spread over the cake. Sprinkle the grated coconut and add strawberries on top of the cool whip and refrigerate for a minimum of 4 hours. 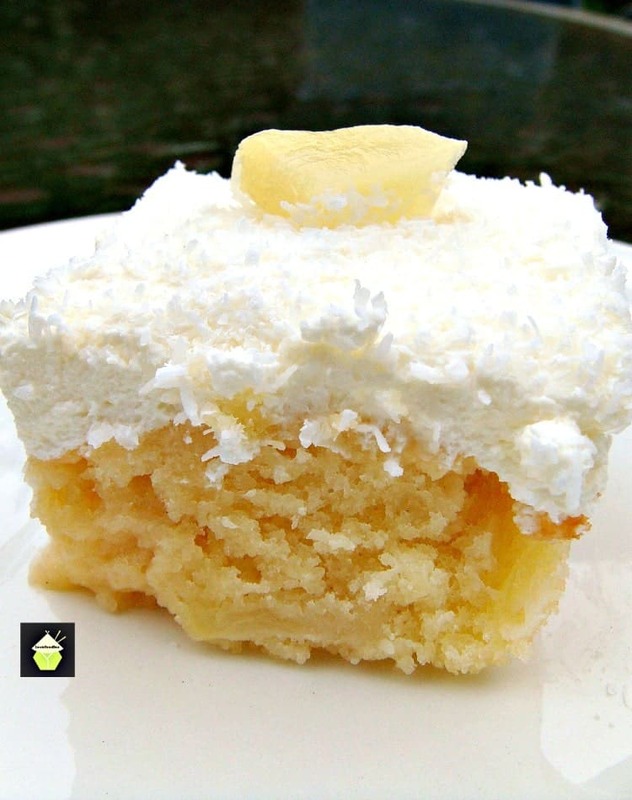 ** If using fresh whipping cream, whip up until stiff then spread on the cake. 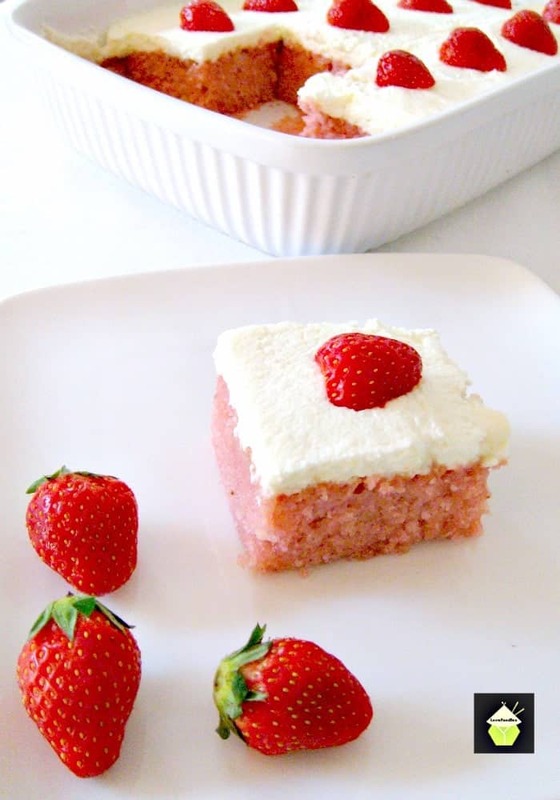 We’d love to hear from you and what you thought of our Strawberry and Coconut Poke Cake recipe. Did you make any changes or add some other goodies? Let us know in the comments below. Thanks for reading and happy cooking! Here are a few more lovely sheet style cake recipes for you to enjoy! Preheat oven to 180 C / 350 F / Gas 4. Grease and flour 9 x 13 pan. In a large bowl, cream together the butter, sugar and powdered strawberry jelly until light and fluffy. Beat in eggs one at a time, mixing well after each. Combine the flour and baking powder; stir into the batter alternately with the coconut milk. Fold in vanilla and strawberry puree. Pour evenly into baking pan. Bake for 25 to 30 minutes in the preheated oven, or until a small knife inserted into the centre of the cake comes out clean. Whilst the cake is still hot, poke holes all over the cake with a skewer or fork then slowly pour the coconut milk all over the cake. Leave to cool. ****Be sure to pour evenly so the liquid soaks in even at the sides. The frosting - do this once the cake has COMPLETELY COOLED! I make this with a layer of sliced bananas before the whipped cream. Be sure and stir in a little lemon juice with the sliced bananas and then lay the slices on top of the cake. It’s called a banana split cake in our circle. Oh my! Mary!!! What a wonderful idea to add the slices of banana too. I am going to try that, and yes, the lemon will definitely stop those ‘nanas from going brown! I really love your idea. Thanks so much for sharing what you do!